Elections in Brazil will be over next Sunday, 28th October. 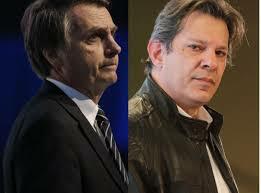 Former army captain Jair Bolsonaro and Workers' Party candidate Fernando Haddad advanced from the first round vote and will face off in the October 28th runoff. Bolsonaro is well ahead on the polls and should win the elections to become Brazil's next president. People are tired of the old politics and are choosing new faces to lead them. Rio will also have 2 candidates fighting each other to become the next governor: Eduardo Paes and Wilson Witzel. The second one is leading the polls and should win.